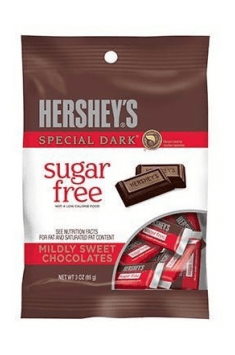 Hershey's Sugar Free Special Dark Midly Sweet Chocolates Bag are bitter chocolates from the iconic American brand of sweets in a new, healthier form. Sugar has been replaced with a healthier and less caloric sweetener – maltitol, which makes this product an ideal alternative for sweets form shops. Chocolates contain 45% of cocoa liquor. Each is separately packed, therefore one can always have them at hand. Chocolate is one of the most popular and at the same time healthy sweets in the world. It is the source of several pro-health compounds – it contains minerals (i. a. magnesium, iron), polyphenol compounds with anti-oxidative character, alkaloids (caffeine and theobromine) and biogenic amines. The content of this compounds is strictly connected with the content of cocoa liquor, that is why bitter chocolate would be the best choice, since it does not contain unnecessary additions. Maltitol is a naturally occurring polyol compound, used as a sweetener. It has the advantage over sucrose, because it is half as caloric, has lower glycemic index and does not contribute to formation of caries. The sweetness of maltitol is in the range of 60-90% of white sugar sweetness. The main source of criticism towards chocolate is sugar. Thanks to changing it for a healthier alternative one does not need to be afraid of ruining diet or silhouette and can benefit from various pro-health effects of eating chocolate. Hershey's Sugar Free Special Dark Midly Sweet Chocolates Bag is a product recommended for every sweetness enthusiast who wants to enjoy the brilliant taste without the any remorse, especially in case of people taking care of their health and silhouette, wanting to loss excess fat tissue and people physically active. A single dose (40g) of the product is recommended. Thanks to separate packaging, chocolates are ideal for a dessert during travels, at work or at university. They taste excellent on their own, but can also be an interesting addition to oatmeal and omelets. Hershey's is a popular brand originating in the United States, founded in 1894 with the aim of producing chocolate-based sweets. Today, the company is known as one of the largest producers of sweet snacks on the American market, managing the distribution of, among others, widely known KitKats. Manufacturers meet the current trends by selling low-calorie delicacies, which include 0-calorie syrups, or candies with low sugar content and a low glycemic index. Ideally suited for diabetics or individuals wanting to maintain a slender figure. Maltitol Cocoa Butter, milk fat, polydextrose, cocoa processed with alkali, contains 2% and less, lecithin (soy), PGPR, emulsifier, vanillin, artificial flavor.